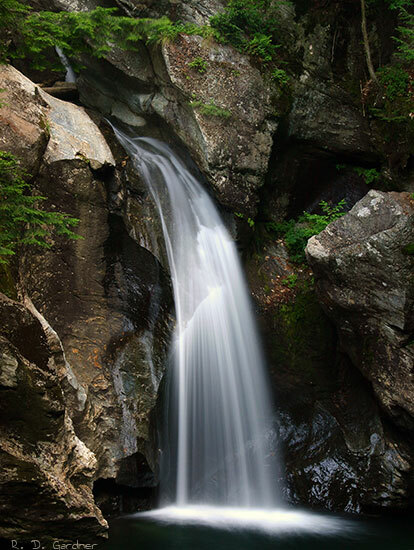 This is a beautifully appointed waterfall just north of the village of Stowe, Vermont. Actually, there are several other cascades and plunges above the main drop shown above. However, one must take care as the area is very steep and viewing points can be dangerous. Nevertheless, there are plenty of opportunities for unique photos. The main plunge is simply gorgeous with evergreens in abundance and many ways to vary the framing of the waterfall. When I visited in early August, 2005, construction work was ongoing to create a concrete path to the base of the falls. I'm not aware of further plans for the area past that little tidbit but apparently some effort is being made to preserve this natural wonder and make it more accessible to the public. 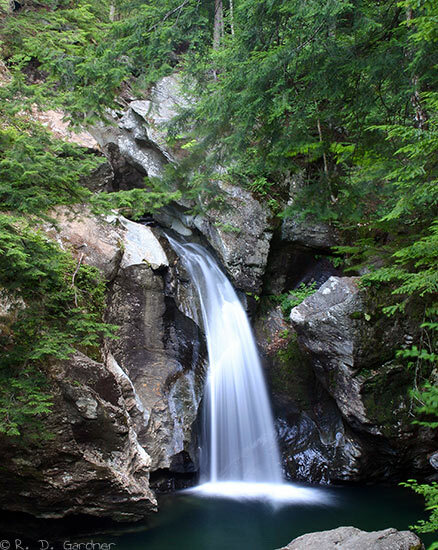 Bingham Falls is located next to Route 108 just north of Stowe, Vermont and before reaching Smugglers Notch. There is a large turnout on the right side of the highway. When I visited the only sign for the falls was on a sign at the turnout and not on the highway itself. With the development around the waterfall I expect at least one good sign is present now. This is a short walk from the parking area. I would estimate the total hike to be 1/4 mile or so round trip, a bit farther if one goes to the base of Bingham Falls. Keep in mind that photography of the main falls is best on the far side and crossing of the creek must be done upstream of the waterfall. I actually balanced on a log to get across. Perhaps you will find a better way across. I arrived on the scene early morning, having left the wife in bed. Regardless you can see rays of light hitting the waterfall. Good or bad, you be the judge - just be aware that unless you are blessed with an overcast sky you will likely be fighting a mixture of sun and shade. I believe late afternoon would be best here. Since you are using a tripod, of course, (you are, aren't you?) you can bracket your exposures and blend the pictures together later with a photo program such as Photoshop. On the bright side, (pun intended) composing the sky out of your pictures is not an issue. Options on composition are plentiful with the rocks and vegetation. I made the mistake of not using any landscape formats. Use both. A polarizer isn't a must at this waterfall but it certainly helps with glare and makes the green vegetation "greener". And we all want a "greener" planet, right? Shutter speed? This one is personal preference but once again I opted for slower shutter speeds and think the results were great. For slower speeds you will need a tripod. For a larger picture of this waterfall, go to my waterfall wallpapers page.